The first two drills were submitted by Kyle Gilreath, Assistant Basketball Coach at Fort Myers (Florida) High School. Kyle previously served for five seasons as an undergraduate manager and graduate assistant for Billy Donovan at Florida. 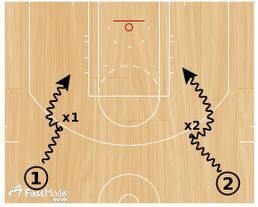 The third drill was posted by Tim Springer, Girls Varsity Basketball Coach at Castle Hills First Baptist School. 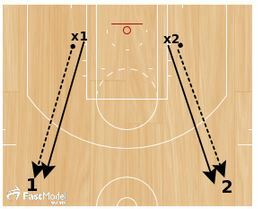 Player starts at block and sprints around opposite cone of catch & shoot jumper. 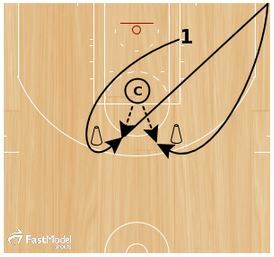 After shooting the player then sprints to the corner and curls back around the other cone for another catch & shoot jumper. After shooting player sprints and touches the other block and repeats the drill from the other direction. Do drill for time or number of makes (10). 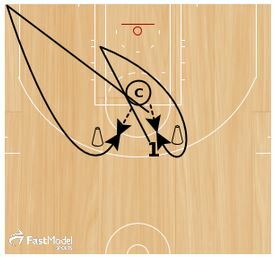 This drill was used by Billy Donovan at Florida. Player stands in the middle of the floor at the top of the key with a coach flanking him on the right wing and the left wing. The player will attempt to take and make as many shots as they can in 1 minute. The player starts by going to their right 1st for a catch and shoot and then turns back to their left (all catches will be made at the slot/elbow extended). You can use other players, managers, or coaches to rebound. 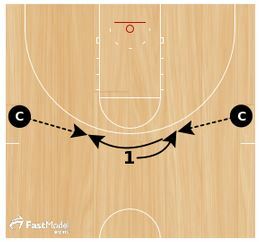 Drill to teach players how to take ground from a defender, make a move based on speed and direction of the defense, and pull up into a jump shot. Defenders pass to offense lined up at volleyball line and then close out. Offense immediately puts the ball on the floor and trys to take ground from the defender. They hit a change of direction when they meet the defender and separate into a jump shot. Players can attack middle or baseline.